Equinox Publishing, Ltd are pleased to announce the publication of two new books in the Advances in Optimality Theory series. Blocking and Complementarity in Phonological Theory by Eric Baković. Further details can be viewed and orders can be placed here. Linguistic Derivations and Filtering: Minimalism and Optimality Theory edited by Hans Broekhuis and Ralf Vogel. Further details can be viewed and orders can be placed here. The good folks at Equinox are happy to offer you 20% off the retail price of these books. Please quote the discount code BCPT when ordering from their website. This offer is valid until the end of March 2013. This entry was posted in Books/Journals on February 4, 2013 by Eric Bakovic. The Phonology of Contrast argues that contrast is one of the central organizing principles of the grammar and provides a formal theory of contrast couched in the framework of Optimality Theory (Prince & Smolensky 1993/2004). The study of the role of contrast is a growing area of interest in linguistics and this monograph contributes to the debate on where contrast fits in the grammar. The key finding is that contrast exists as an independent principle in the grammar, which in the framework of Optimality Theory can be formulated as a family of rankable and violable constraints. A formal proposal of contrast is developed called Contrast Preservation Theory. This proposal is illustrated and supported with diverse contrast phenomena in the areas of phonology and at the phonology-morphology interface. Evidence is drawn from a number of languages including Finnish, Arabic, and Polish. Predictions of the proposal are discussed and compared with alternatives. This entry was posted in Books/Journals on July 13, 2012 by Eric Bakovic. Describing a new and appealing way of analysing speech sounds, this book introduces you to the theory of elements in phonology. Traditional features are capable of describing segments and segmental patterns, but they are often unable to explain why those patterns are the way they are. By using elements to represent segmental structure, we begin to understand why languages show such a strong preference for certain kinds of segments, contrasts, phonological processes and sound changes. Using examples from a wide range of languages, this book demonstrates the process of analysing phonological data using elements, and gives readers the opportunity to compare element-based and feature-based accounts of the same phonological patterns. Backley also challenges traditional views through his innovative analysis of English weak vowels and diphthongs and his unified treatment of linking r and intrusive r as glide formation processes. Providing a thorough introduction to the main topics in segmental phonology, this is an excellent overview for both students with a background in standard phonology as well as for those who are new to the field. This entry was posted in Books/Journals on October 5, 2011 by Eric Bakovic. Fearless editors Marc van Oostendorp, Colin J. Ewen, Elizabeth Hume, and Keren Rice — not to mention the 138 contributors of the 124 chapters — have completed the mammoth Blackwell Companion to Phonology and it is now available for purchase by libraries. The reviews are in, the contents sorted, the faqs answered — and some sample chapters posted: Andrew Wedel on “Self-organization in Phonology“, B. Elan Dresher on “The Phoneme“, Ronnie Wilbur on “Sign Syllables“, Michael Becker and Kathryn Flack Potts on “The Emergence of the Unmarked“, Nancy Hall on “Vowel Epenthesis“, and Carlos Gussenhoven on “Sentential Prominence in English“. Check these freebies out. Available online or as a five-volume print set, The Blackwell Companion to Phonology is a major reference work drawing together 124 new contributions from leading scholars in the field. Led by a renowned team of international scholars, the Companion represents a diverse range of approaches and methodologies to the key phenomena in phonological research. In contrast to other handbooks and reference works currently available for phonology, the Companion focuses on phenomena and case studies to highlight historical and ongoing debates in the field. The Companion will be a touchstone for future phonological theorists, giving an overview of all the data and insights which any good theory of phonology should be able to cover. The online platform provides audio files and links to external web content, as well as interactive cross-referencing and powerful searching and browsing capabilities. Simultaneously offering broad coverage and a high level of detail, The Blackwell Companion to Phonology is a landmark work that will be indispensable to students and researchers in the field for years to come. This entry was posted in Books/Journals on March 15, 2011 by Eric Bakovic. This volume presents a series of original papers focusing on phonological argumentation, set within the framework of Optimality Theory. It contains two major sections: chapters about the evidence for and methodology used in discovering the bases of phonological theory, i.e., how constraints are formed and what sort of evidence is relevant in positing them; and case studies that focus on particular theoretical issues within Optimality Theory, usually through selected phenomena in one or more languages, arguing in favor of or against specific formal analyses. A noteworthy detail of this book is that all of the contributors are connected with the program in phonology and phonetics at the University of Massachusetts Amherst, either as current professors or former graduate students. Consequently, all of them have been directly influenced by John McCarthy, one of the major proponents of Optimality Theory. This collection will therefore be of interest to anyone who seriously follows the field of Optimality Theory. The intended readership is primarily graduate students and those already holding an advanced degree in linguistics. This entry was posted in Books/Journals on July 21, 2010 by Eric Bakovic. IULC Publications, the linguistics graduate student run publications group at Indiana University, is pleased to announce the release of the 8th volume in its working papers series: African Linguistics Across the Discipline, edited by Jonathan Anderson, Christopher Green, and Samuel Obeng. This working papers includes a number of works from IU graduate students, current faculty, and recent alums, many of which focus on phonology and phonological theory. Please visit IULC Publications to view the full table of contents and to order yourself a copy of the volume. IULC Publications also has two other volumes in their series (Vol 1 and 6) that focus on phonology. Other phonology-specific titles can also be found. This entry was posted in Books/Journals and tagged African linguistics, linguistics publications, phonology on February 15, 2010 by Christopher Green. Three newly released edited volumes caught my eye on LINGUIST List (here, here, and here), and I thought I’d mention them together in one post. Hey, they’re not completely unrelated, right? This entry was posted in Books/Journals on December 10, 2009 by Eric Bakovic. ‘Contrast’ — the opposition between distinctive sounds in a language — is one of the most central concepts in linguistics. This book presents an original account of the logic and history of contrast in phonology. It provides empirical evidence from diverse phonological domains that only contrastive features are computed by the phonological component of grammar. It argues that the contrastive specifications of phonemes are governed by language-particular feature hierarchies. This approach assigns a key role to abstract cognitive structures, challenging contemporary approaches that favour phonetic explanations of phonological phenomena. Tracing the evolution of the hypothesis that contrastive features play a special role in phonology, it shows how this insight has been obscured by misunderstandings of the role of the contrastive feature hierarchy. 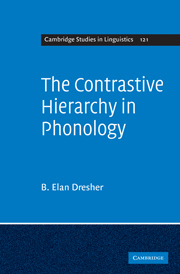 Questioning the widely held notion that contrast should be based on minimal pairs, Elan Dresher argues that the contrastive hierarchy is indispensable to illuminating accounts of phonological patterning. This entry was posted in Books/Journals on September 28, 2009 by Eric Bakovic. Beckman, Jessen, and Ringen on German fricative devoicing; Flack on onsets and codas of words and phrases; Heinz on learning stress patterns; Kochetov reviews Phonetically-based phonology; Ussishkin reviews Canonical forms in prosodic morphology. TOC here. This entry was posted in Books/Journals on September 8, 2009 by Eric Bakovic. This entry was posted in Announcements, Books/Journals on September 1, 2009 by Geoffrey Nathan. Special issue on Phonological models and experimental data, co-edited by Coetzee, Kager, and Pater. See the TOC here. This entry was posted in Books/Journals on July 11, 2009 by Eric Bakovic. This entry was posted in Books/Journals on April 19, 2009 by Eric Bakovic. Charles (Chuck) Kisseberth occupies a unique position in phonology (comparable to the late Ken Hale’s in syntax). He has conducted trailblazing research at both the theoretical and descriptive levels, treating the two as different aspects of the same grand enterprise. His many papers and books over his 40 year career are commonly regarded as masterpieces of phonological analysis with mountains of data to support each step of the argument. Many of the most intriguing data sets that have continued to occupy our ﬁeld’s attention were either originally discovered by or brought to our general attention by Chuck: Yawelmani vowels and syllable structure, Klamath global rules, Tonkawa derivational constraints, Chimwini sentential phonology, Bantu migrating tones. His early work on rule ordering, conspiracies, and derivational constraints diagnosed serious problems with the strictly bottom-up, derivational model of classical generative phonology. This fundamental insight was given its proper due only some 25 years later with the development of Optimality Theory. Chuck has been an active contributor to the OT literature with his Optimal Domains model of autosegmental phonology (in collaboration with Jennifer Cole and Farida Cassimjee). Chuck has been equally successful as a teacher and mentor. He has directed over forty doctoral dissertations — many by native speaker linguists describing their languages for the ﬁrst time. Our 1979 textbook Generative Phonology: Description and Theory was the table at which a whole generation of linguists were served their ﬁrst taste of phonology. We hope that the studies presented here provide him some recompense for his inspiration, guidance, and friendship over the years. The TOC is below the fold; if you have access, check out the issue itself here. This entry was posted in Books/Journals on March 12, 2009 by Eric Bakovic. The latest (online) issue (Vol. 25, Iss. 3) has recently been announced. This entry was posted in Books/Journals on March 1, 2009 by Eric Bakovic. This textbook introduces the reader to the field of phonology, from allophones to faithfulness and exemplars. It assumes no prior knowledge of the field, and includes a brief review chapter on phonetics. It is written within the framework of Cognitive Linguistics, but covers a wide range of historical and contemporary theories, from the Prague School to Optimality Theory. While many examples are based on American and British English, there are also discussions of some aspects of French and German colloquial speech and phonological analysis problems from many other languages around the world. In addition to the basics of phoneme theory, features, and morphophonemics there are chapters on casual speech, first and second language acquisition and historical change. A final chapter covers a number of issues in contemporary phonological theory, including some of the classic debates in Generative Phonology (rule ordering, abstractness, ‘derivationalism’) and proposals for usage-based phonologies. This entry was posted in Books/Journals on December 10, 2008 by Geoffrey Nathan. To celebrate the 25th volume of Phonology, the editors have put together a special retrospective issue, spanning a quarter-century of outstanding work from the only journal dedicated entirely to phonology. Included in this special collection is material from the recently launched Phonology Digital Archive. Download any of these papers for free until December 31st 2008. This entry was posted in Books/Journals on November 26, 2008 by Eric Bakovic. In case you missed it, there’s a special section of Lingua vol. 118, no. 12 on the phonetics and phonology of glides, guest edited by Ioana Chitoran and Andrew Nevins, which “developed from presentations at the workshop ‘Towards a phonetic and phonological typology of glides’, organized as part of the 2006 Annual Meeting of the Linguistic Society of America, in Albuquerque, New Mexico”. Check it out. This entry was posted in Books/Journals on November 22, 2008 by Eric Bakovic. The latest (online) issue (Vol. 25, Iss. 2) has recently been announced. Lenition and Fortition (Studies in Generative Grammar 99, Mouton de Gruyter), ed. by Joaquim Brandão de Carvalho, Tobias Scheer, and Philippe Ségéral. There are books on tone, coronals, the internal structure of segments, vowel harmony, and a couple of other topics in phonology. This book aims to fill the gap for Lenition and Fortition, which is one of the first phenomena that was addressed by phonologists in the 19th century, and ever since contributed to phonological thinking. It is certainly one of the core phenomena that is found in the phonology of natural language: together with assimilations, the other important family of phenomena, Lenition and Fortition constitute the heart of what phonology can do to sound. The book aims to provide an overall treatment of the question in its many aspects: historical, typological, synchronic, diachronic, empirical and theoretical. Various current approaches to phonology are represented. The book is structured into three parts: 1) properties and behaviour of Lenition/Fortition, 2) lenition patterns in particular languages and language families, 3) how Lenition/Fortition work. This entry was posted in Books/Journals on November 6, 2008 by Eric Bakovic. This book looks at the range of possible syllables in human languages. The syllable is a central notion in phonology but basic questions about it remain poorly understood and phonologists are divided on even the most elementary issues. For example, the word city has been syllabified as ci-ty (the ‘maximal onset’ analysis), cit-y (the ‘no-open-lax-V’ analysis), and cit-ty (the ‘geminate C’ analysis). San Duanmu explores and clarifies these and many other related issues through an in-depth analysis of entire lexicons of several languages. Some languages, such as Standard and Shanghai Chinese, have fairly simple syllables, yet a minimal difference in syllable structure has lead to a dramatic difference in tonal behavior. Other languages, such as English, German, and Jiarong, have long consonant clusters and have been thought to require very large syllables: San Duanmu shows that the actual syllable structure in these languages is much simpler. He bases his analyses on quantitative data, paying equal attention to generalizations that are likely to be universal. He shows that a successful analysis of the syllable must take into account several theories, including feature theory, the Weight-Stress Principle, the size of morpheme inventory, and the metrical representation of the syllable. San Duanmu’s clear exposition will appeal to phonologists and advanced students and will provide a new benchmark in syllabic and prosodic analysis. He also offers an answer to the intriguing question: how different can human languages be? This entry was posted in Books/Journals on October 17, 2008 by Eric Bakovic. This book takes contrast, an issue that has been central to phonological theory since Saussure, as its central theme, making explicit its importance to phonological theory, perception, and acquisition. The volume brings together a number of different contemporary approaches to the theory of contrast, including chapters set within more abstract representation-based theories, as well as chapters that focus on functional phonetic theories and perceptual constraints. This book will be of interest to phonologists, phoneticians, psycholinguists, researchers in first and second language acquisition, and cognitive scientists interested in current thinking on this exciting topic. This entry was posted in Books/Journals on October 13, 2008 by Eric Bakovic. The latest (online) issue (Vol. 25, Iss. 1) has just been announced, and here’s the TOC + abstracts. Truth be told, I’m a history-of-the-field buff and so I’m looking forward to reading Goldsmith’s article. This entry was posted in Books/Journals on June 12, 2008 by Eric Bakovic. This entry was posted in Books/Journals on May 8, 2008 by Eric Bakovic. OUP has also just announced this book, by Jeff Mielke, based on his 2004 OSU dissertation. This entry was posted in Books/Journals on March 25, 2008 by Eric Bakovic. Just announced on LINGUIST List: The Phonological Enterprise, by Charles Reiss and Mark Hale (Oxford University Press, Feb. 2008). Re-examines foundational issues in phonology, linguistics, and cognitive science. Develops a coherent picture of the study of phonology and its relationship to other disciplines. Written with wit and in a clear and pedagogic style. This book scrutinizes recent work in phonological theory from the perspective of Chomskyan generative linguistics and argues that progress in the field depends on taking seriously the idea that phonology is best studied as a mental computational system derived from an innate base, phonological Universal Grammar. Two simple problems of phonological analysis provide a frame for a variety of topics throughout the book. The competence-performance distinction and markedness theory are both addressed in some detail, especially with reference to phonological acquisition. Several aspects of Optimality Theory, including the use of Output-Output Correspondence, functionalist argumentation and dependence on typological justification are critiqued. The authors draw on their expertise in historical linguistics to argue that diachronic evidence is often mis-used to bolster phonological arguments, and they present a vision of the proper use of such evidence. Issues of general interest for cognitive scientists, such as whether categories are discrete and whether mental computation is probabilistic are also addressed. The book ends with concrete proposals to guide future phonological research. The breadth and depth of the discussion, ranging from details of current analyses to the philosophical underpinnings of linguistic science, is presented in a direct style with as little recourse to technical language as possible. This entry was posted in Books/Journals on February 2, 2008 by Eric Bakovic. Speaking of Charles Reiss: he has an article co-authored with Frédéric Mailhot (“Computing Long-Distance Dependencies in Vowel Harmony“) in the first issue of the new open access journal Biolinguistics. Bridget Samuels also contributed the first review article to the new journal (“On Evolutionary Phonology“), and happens to also be one of the invited speakers to NAPhC5. This entry was posted in Books/Journals on January 26, 2008 by Eric Bakovic. This entry was posted in Books/Journals on January 13, 2008 by Eric Bakovic. Fans of prosodic phonology rejoice: a new edition (with a new foreword/preface) of Nespor & Vogel’s classic Prosodic Phonology (1986) has just been published in the Studies in Generative Grammar series of Mouton de Gruyter. This entry was posted in Books/Journals on December 21, 2007 by Eric Bakovic. Over the past decades, experimental data have been used increasingly as evidence in phonological theorising. The success of the LabPhon conferences and the associated book series is evidence of this. However, most research in laboratory phonology eschews the kinds of formal grammatical models used in theoretical phonology. LabPhon papers tend to be neutral with respect to choice of grammatical model, or explicitly argue against a phonological grammar approach. On the other hand, research in theoretical phonology tends to rely solely on descriptive grammars or fieldwork as its empirical base. This thematic issue aims to build further bridges between theoretical phonology and laboratory phonology. This entry was posted in Books/Journals on December 1, 2007 by Eric Bakovic. There’s a nice review of Odden’s textbook by Anthi Revithiadou in the most recent issue of Lingua — apologies to those without access, but according to Revithiadou’s publications page, you can e-mail her for a copy. This entry was posted in Books/Journals on November 18, 2007 by Eric Bakovic. Maria-Josep Solé, Patrice Speeter Beddor, and Manjari Ohala (eds. ), Experimental Approaches to Phonology. Oxford University Press, 2007. This wide-ranging survey of experimental methods in phonetics and phonology shows the insights and results provided by different methods of investigation, including laboratory-based, statistical, psycholinguistic, computational-modeling, corpus, and field techniques. The five chapters in the first part of the book examine the recent history and interrelations of theory and method. The remaining 18 chapters are organized into parts devoted to four key current areas of research: phonological universals; phonetic variation and phonological change; maintaining, enhancing, and modeling phonological contrasts; and phonological knowledge. The book provides fresh insights into the findings and theoretical advances that emerge from experimental investigation of phonological structure and phonological knowledge, as well as critical perspectives on experimental methods in the perception, production, and modeling of speech. This book will be a valuable asset for all researchers into the sound structure of language, including scholars and advanced students of phonetics, phonology, speech science, psycholinguistics, and applied linguistics. This entry was posted in Books/Journals on July 29, 2007 by Eric Bakovic. This entry was posted in Books/Journals on May 22, 2007 by Eric Bakovic. OT and English phonology, anyone? -English Historical Syntax. This volume would presuppose a basic knowledge of (English) syntax and of the history of English. -Optimality Theory and the Phonology of English. Such a volume would presuppose a working knowledge of the mainstream phonological phenomena of English, and of phonological terminology and notation. It would introduce and develop a version of Optimality Theory so as to present a coherent picture of the phonology of English. Anyone here want to tackle the second of these? Contact the series editor, Heinz Giegerich. This entry was posted in Books/Journals on May 2, 2007 by Eric Bakovic. February 28 was the official publication date of The Cambridge Handbook of Phonology, previously mentioned here! The hardcover version costs $150/£80. After selling off a batch of these to libraries, we can hope that CUP will seriously consider issuing a less expensive soft cover version (and, reportedly, an e-book too). You can search the entire text of the book, making it the most searchable printed book available. You can search the references and download them in a variety of formats. There is a forum for people to discuss the chapters (and phonology in general). Please encourage your students to use it! It has additional material (e.g., ‘further reading’ lists that many authors have provided, errata, etc.). There may eventually be other things available related to each chapter (e.g., handouts, related papers, teaching materials, webpage links, audio, video…). Thanks to Handbook editor Paul de Lacy for putting such extraordinary work into this! This entry was posted in Books/Journals on March 3, 2007 by Eric Bakovic. At long last, Cambridge University Press is publishing The Cambridge Handbook of Phonology, edited by Paul de Lacy, this month. The picture of the book off to the right links to Amazon.com, but go to the CUP page to get more information about the book, including PDFs of the front matter and such. There is also a supplementary website for the book (which looks to be still under development) here. Phonology – the study of how the sounds of speech are represented in our minds – is one of the core areas of linguistic theory, and is central to the study of human language. This state-of-the-art handbook brings together the world’s leading experts in phonology to present the most comprehensive and detailed overview of the field to date. 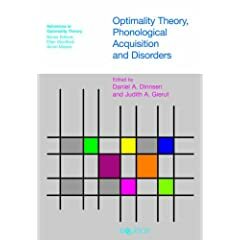 Focusing on the most recent research and the most influential theories, the authors discuss each of the central issues in phonological theory, explore a variety of empirical phenomena, and show how phonology interacts with other aspects of language such as syntax, morphology, phonetics, and language acquisition. Providing a one-stop guide to every aspect of this important field, The Cambridge Handbook of Phonology will serve as an invaluable source of readings for advanced undergraduate and graduate students, an informative overview for linguists, and a useful starting point for anyone beginning phonological research. This entry was posted in Books/Journals on February 3, 2007 by Eric Bakovic. When Languages Die: The extinction of the world’s languages and the erosion of human knowledge, by K. David Harrison. The Phonology of Standard Chinese (2nd ed. ), by San Duanmu. The first, which I also mentioned here, is not strictly about phonology — but it’s written by a phonologist, so there you go. This entry was posted in Books/Journals on January 31, 2007 by Eric Bakovic. This entry was posted in Books/Journals on December 4, 2006 by Eric Bakovic. Here are a few books recently announced on LINGUIST List of potential interest to phonoloblog readers. This entry was posted in Books/Journals on November 26, 2006 by Eric Bakovic. The process of adult acquisition of a second language phonology is a lengthy one, which makes it particularly difficult to study. It is hard to follow learners across years and decades to watch the process unfold, so, as the author of this monograph points out, the majority of studies have been synchronic rather than longitudinal. They have therefore focused on more salient transfer and developmental phenomena with less information about long-term processes. Hansen proposes to remedy this situation by reporting on a year-length study of the English phonological acquisition of two adult Vietnamese speakers. This entry was posted in Books/Journals on November 20, 2006 by Eric Bakovic. This book presents a corpus-based test of a simple idea, that English favors an alternating pattern of stressed/non-stressed syllables in word and phrase structure. The Principle of Rhythmic Alternation can be discerned in texts dating from the 16th century to the present, and has (the author argues) influenced the development of the language in subtle ways. It begins by examining the distribution of competing forms, e.g. ‘worse’ and ‘worser’. Although ‘worse’ has always been the suppleted form of ‘bad’, most other comparatives had an –er ending (e.g. ‘richer’), so there was considerable pressure to fill out the paradigm. These two forms competed with each other from late medieval times, but ‘worser’ persisted longer than it should have in prenominal position before eventually dying out. The reason is that ‘worser’ contains an extra (weak) syllable, which the rhythmic grammar favors as a buffer between the stressed syllable of the adjective itself and the typically stressed first syllable of the noun it modifies. ‘Worser’ gave way to ‘worse’ much sooner in other syntactic environments where the specter of a stress clash did not arise. In other words, the preference for rhythmic alternation tipped the scales in favor of one syntactic variant over another. This entry was posted in Books/Journals on October 12, 2006 by Eric Bakovic. This book presents an attempt to investigate major issues in Korean phonology in terms of principles and elements, based on the framework of Government Phonology. It begins with an introductory section, describing central aspects of the framework, which include recent development in the theory with regard to the representation of ATR and coronals. An analysis of a wide range of data in Korean phonology is then provided. In dealing with data involving vowels, the study first discusses vowel harmony, which has traditionally been treated as the result of the harmonic opposition between ‘light vowels’ and ‘dark vowels’. It address some unsolved problems in previous analyses by proposing a phonological operation called ‘A-head alignment’. This will be followed by an element-based analysis of vowel coalescence and diphthongisation. This entry was posted in Books/Journals on October 8, 2006 by Eric Bakovic. Tyvan (aka Tuvan/Tuvinian) is spoken by 150-200,000 people in the Republic of Tyva in south centra Siberia. Tyvan (along with the closely related Tofalar) stand out among the Turkic languages in several ways. Tyvan has three sets of phonemic vowels: plain, long, and creaky voice. Word-initially obstruents exhibit a contrast between unaspirated/aspirated or voiced/voiceless, depending on the speaker. There is also a phonemically marginal series of long nasalized vowels. Tyvan has only one inflectional series for verbs, prefering enclitic pronominals in most forms (in main clauses). This entry was posted in Books/Journals on October 4, 2006 by Eric Bakovic. This study presents an extended discussion and analysis of a seemingly idiosyncratic syncope process governing the verbal prefix string of Tlingit, a highly endangered and understudied Na-Dene language of Southeast Alaska and Northern British Columbia. This entry was posted in Books/Journals on October 1, 2006 by Eric Bakovic. (c) a mechanism allowing the distinction between marked and unmarked sounds to be collapsed (‘conflation’). This entry was posted in Books/Journals on September 26, 2006 by Eric Bakovic. In order to obtain a PhD in the Netherlands one traditionally submits not just a dissertation but also a list of approximately ten stellingen, i.e. ‘theses’ or ‘propositions’ of one or two sentences each. A few of these summarise the main themes of the book, but there are also a few which have a broader outlook. Fieldwork linguists should be more occupied with theoretical linguistics, and theoretical linguists more with fieldwork linguistics. Toshi’s own work is a good illustration of how fruitful it can be to do fieldwork with a solid theoretical background, and work on the theory with a good grasp of the problems with the data. He spent a lot of time on the island of Sakhalin, in the Russian Far East, where the language is still spoken by a few hundred older people. But he did not just randomly collect data: his dissertation contributes to at least two important topical debates in current theory: about the precise representation of laryngeal contrasts, and about the phonology-syntax interface (since Nivkh has an interesting process of consonant mutation, which according to Shiraishi occurs at the edges of syntactic phrases). The text of the dissertation is available here. This entry was posted in Books/Journals on September 3, 2006 by marc. Here’s the more informative blurb and TOC at SIL.org. Anyone seen/used this book? If so, what did you think of it? This entry was posted in Books/Journals on July 31, 2006 by Eric Bakovic. In case you missed the announcement on the Optimal List of the posting on the Rutgers Optimality Archive, Junko Ito, John McCarthy and I recently finished editing an online collection of papers written in honor of Alan Prince on the occasion of his 60th birthday (on June 20). This entry was posted in Books/Journals on July 12, 2006 by Eric Bakovic. Juliette Blevins‘ book Evolutionary Phonology was just reviewed on LinguistList. The text of the review is copied below. This entry was posted in Books/Journals on March 11, 2006 by Eric Bakovic. Newman’s Coursebook in Feature Geometry (LINCOM, 2003). I don’t have time, but maybe a phonoloblog reader out there does, and I’ll be happy to cross-post. This entry was posted in Books/Journals on February 2, 2006 by Eric Bakovic. This collection of articles on stress and tone in various Athabaskan languages will interest theoretical linguists and historically oriented linguists alike. The volume brings to light new data on the phonetics and/or phonology of prosody (stress, tone, intonation) in various Athabaskan languages, Chiricahua Apache, Dene Soun’liné, Jicarilla Apache, Sekani, Slave, Tahltan, Tanacross, Western Apache, and Witsuwit’en. As well, some contributions describe how prosody is to be reconstructed for Proto-Athabaskan, and how it evolved in some of the daughter languages. This entry was posted in Books/Journals on November 2, 2005 by Eric Bakovic. [A]n idiosyncratic and contradictory core, the product of history and its inescapable whims, will always remain. Linguists who deny this core and attempt to provide a synchronic explanation to all aspects of the phonology of a language– a common attitude, especially in OT– behave a little bit like individuals who, when faced with the painful contradictions of reality, retreat into magical thinking and try to give sense, through mysterious correspondences, to what is otherwise a broken, shattered and meaningless existence. Let me start out by saying that, after downloading this manuscript and taking a look at some of what it covers, I have every reason to be interested in reading it. I’ve always liked Calabrese’s work; his dissertation influenced some of my thinking as I wrote my own dissertation. But there’s something truly shameful in tossing off a claim like the one quoted above. This entry was posted in Books/Journals, General on October 19, 2005 by Eric Bakovic. Speaking of the Optimal List: I forgot to cross-post here one of the very first non-ROA announcements that came through when I decided to turn the list into an announcement-only venue. It’s an announcement for a new book series, Advances in Optimality Theory, edited by Ellen Woolford and Armin Mester. Two books have so far been advertised to appear in the series, both phonology-related: Hidden Generalizations: Phonological Opacity in Optimality Theory (by John J. McCarthy, May 2006) and Optimality Theory, Phonological Acquisition and Disorders (ed. by Daniel A. Dinnsen & Judith A. Gierut, December 2006). This entry was posted in Books/Journals, General on June 7, 2005 by Eric Bakovic. Tonio Green has just posted a complete draft of his interesting book Phonology Limited on the Rutgers Optimality Archive. For those of you who do not regularly visit the Archive or subscribe to the Optimal List — the latter having become pretty much just an announcement list for new postings on the Archive — the abstract for the book is copied below. This entry was posted in Books/Journals on June 7, 2005 by Eric Bakovic. There’s a review on LinguistList of Hayes, Kirchner, Steriade (eds.) Phonetically-Based Phonology (announced on phonoloblog back in November). The text of the review is copied below. This entry was posted in Books/Journals on May 3, 2005 by Eric Bakovic. We are pleased to announce the publication of Phonetically Based Phonology, a book we have jointly edited. The book presents a general approach to phonology in which many of the constraints are the instantiations in grammar of principles of speech perception, speech production and lexical access. The introductory chapter, by Hayes and Steriade, may be downloaded from this site; in addition, several of the individual chapters can be previewed in draft form from the author’s web sites, which are linked from the web page just given. This entry was posted in Books/Journals on November 7, 2004 by Bruce Hayes.